IT WAS the best of times, it was the worst of times, it was the age of wisdom, it was the age of foolishness, it was the epoch of belief, it was the epoch of incredulity, it was the season of Light, it was the season of Darkness, it was the spring of hope, it was the winter of despair, we had everything before us, we had nothing before us, we were all going direct to Heaven, we were all going direct the other way- in short, the period was so far like the present period, that some of its noisiest authorities insisted on its being received, for good or for evil, in the superlative degree of comparison only. Charles Dickens wrote these opening lines in his novel, Tale of Two Cities. It could very well have been written for the Vietnam War. Certainly for my 14-month Vietnam War tour of duty. The war in Vietnam was looming bigger each year. The Tet Offensive, one of the largest military campaigns of the Vietnam War, launched on January 30, 1968 by forces of the Viet Cong and North Vietnamese People’s Army of Vietnam against the forces against the forces of South Vietnam, the United States, and their allies. This was a campaign of surprise attacks against military and civilian commands and control centers throughout South Vietnam. The name of the offensive comes from the Tết holiday, the Vietnamese New Year, when the first major attacks took place. I was drafted in May 1968. I went through the rigors of basic training at Fort Ord, a United States Army post on Monterey Bay of the Pacific Ocean coast in California and trained on firing ranges with hand grenades, M18 Claymore anti-personnel mines and rifles. The beach was the military firing range and closed to the public for nearly 77 years. I recall that at the rifle range it was so cold and windy and the Army field jacket so inadequate that I envied the drivers in passing vehicles with their heaters blasting. Completing basic training I was sent to Ft. Sam Houston, San Antonio, Texas for combat medic and medical laboratory training. After the training in 1969 I was ordered back to Ft. Ord to Silas B. Hayes Army Community Hospital, as my first duty station. I became the non-commissioned officer in charge of one of the primary hospital medical laboratories. I lived off the post just above Cannery Row. I had read the novel, Cannery Row (1945) written by John Steinbeck and my curious writer’s mind was invigorated as I visited the areas depicted so well in his book and began my own novels and short stories when off duty. I had wanted to be a novelist since I was a child. My older sister said I was writing short stories at least by age four. Nonetheless, I knew that it was inevitable that I would be sent to Vietnam in the medical field. And whatever the future held for me, I trusted writing would be of significance. I was kept very busy as we were short staffed since many personnel had been shipped to Vietnam. In a small room in the hospital laboratory there were approximately fifty whole human brains sitting silently, preserved in large specimen jars of formaldehyde. I remembered spending what time I could spare gazing into each of the jars and wondering about the person whose brain now floated in formaldehyde. There were numerous cases of meningitis on the base that were affecting the recruits going through basic training in epidemic intensity. Among my responsibilities, was to test for the antibiotics used to treat the soldiers. Sometimes, whatever the doctors were doing were not effective fast enough and the soldiers died. Their brains ended up in my laboratory. Although I never met the soldiers, I had an affinity with them since I was testing the antibiotics to be used on their behalf. As you can imagine it was almost surreal to be standing in a small sterile room observing their brains. It is an awesome experience to look at numerous human brains at the same time. I imagine this is not an experience most of you have had and probably never will. Think of what you’d experience doing this. Not long after this experience I finally did receive my anticipated orders to go to Vietnam for a tour of duty. Given several intense issues in my childhood including sexual child abuse and recruitment into a violent gang, I thought I was better prepared to handle duty in a war zone than some of the young men. Therefore, I did not fight being drafted or sent to Vietnam. In an odd sort of way, I also think this experience with the human brains in the jars gave me some enlightenment that helped prepare me for some aspects of military medical service in a war zone, including one especially poignant experience as a combat medic I volunteered for, where imminent death was often the norm. In 2006, I again lived in Monterey for a while photographing wildlife and nature. I decided to visit the Silas B. Hayes Army Community Hospital, Ft. Ord and was surprised that the base had closed. Driving around it felt like a ghost town not like the vast busy base I had once known. Now Fort Ord Dunes State Park is the biggest California coastal ocean park in modern history. No housing, no development on it, open to the public. The State Park has a 1,500-foot trail to 4 miles of ocean beach with beautiful views of Monterey Bay. From the parking area visitors may also take a stroll on the new boardwalk to a bluff top viewing platform. Existing park roads are open to bicyclists, hikers and dogs on leash. 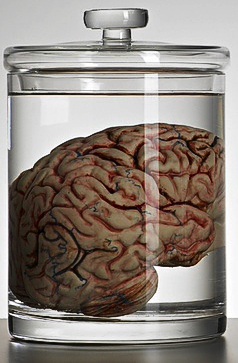 To this day, I still think about that experience looking into the large glass containers of human brains. I have wondered about and then studied the neuroanatomy and neurobiology of the brain for many years. This has greatly enhanced my many years as a therapist and now life coach. Some of you may be aware that Albert Einstein’s brain was taken by Thomas Harvey, the pathologist who did the autopsy, who at one point was storing it in a cider box. Harvey would send small chunks to researchers, and many slides mounted with thin slices of Einstein’s brain are now lost. It is reported that the researchers found that Einstein’s brain was 15% wider than average, due to the fact that the inferior parietal regions on both hemispheres were much more developed than most. This would have given Einstein some powerful visualization skills, given that these regions of the brain are largely responsible for visuospatial cognition, mathematical thought, and imagery of movement. They also reportedly found that Einstein’s brain lacked the groove which usually runs through part of this area, which suggests that the neurons might have been able to work together more easily given their proximity. On one occasion, Einstein said, “I have no special talents, I am only passionately curious.” These days, Einstein’s brain is sitting in jars of formaldehyde at Princeton Hospital. In my Life Coaching and workshops, classes and retreats I still teach the value of curiosity in our lives. At Yale, the pioneering neurosurgeon, Harvey Cushing, started a collection of human brains in 1902. Decades after his death they were discovered in the early 1990s in a dormitory sub-basement by a group of medical students. In 2010, the brains, cleaned and housed in their original jars, were put on display in the university’s new Cushing Center. The Indiana Medical History Museum in Indianapolis owns a collection of preserved brains and brain chunks that were taken from mentally ill patients during autopsies. An Indiana University pathologist has been trying to extract DNA from them to search for genes related to schizophrenia and other disorders. DNA extracted from human brains may help researchers studying mental health disorders including schizophrenia. Since violent mass murders are escalating by those considered mentally ill, studying preserved brain specimens could help in the treatment of mental illness. As a child I resided with my family for a time in Staten Island, New York. This prompted my curiosity when I read about a tragic a surreal coincidence that occurred in Richmond County, Staten Island, New York. Jesse Shipley, 17, died in a car crash in 2005, and medical the examiner Dr. Stephen de Roux, decided to keep Jesse’s brain. Jesse’s girlfriend happened to be on the school field trip and after the trauma of viewing his brain she ran outside crying and called her mom and said, ‘Mom, Jesse’s brain is here! I can’t be here.’ His parents had agreed to an autopsy in which the brain was removed. However, they were unaware the body was released by the medical examiner, and that it was eventually buried, without his brain. I am reminded of a song by Nicholas Dobson. Lyrics by Micah Ball. This entry was posted in Musings and tagged Army, Einstein, Ft. Ord, Human brains, Schizophrenia, Vietnam War.